“Why are all my facebook sidebar advertisements about weight loss? ?” says the woman eating straight out of a mostly empty bag of mini Nutter Butters. So one of those dear newly-befriendeds sent me a thank you note for accepting her friend request. I’m thinking she might notice if I suddenly drop her–will have to go with the hide/block for now. But seriously, a thank you note? I’m trying to decide if that’s incredibly sweet or incredibly creepy. I think I know which direction I’m leaning. I’ve had about 20 friend requests sitting in my little FB friend request box for months now. I finally decided to accept three of them and almost instantaneously regretted it. Is it just coincidence that these three now constitute 95% of my news feed? Your child drank two whole cups of ice water after playing outside in 90 degree weather? Really? Stop the presses! A link to a “nice article” about Days of Our Lives? And you want to know if I have “any thoughts”? Really? Watching the CMA’s last night with your kids was a memory that will last forever? FOR-EVER? Really?? Either way, I don’t care! Stop posting, people! What is the proper etiquette for unfriending someone? Is there a minimum time you must try them out before you pull the plug? Or can I just call it now? Last night Goose went roller skating with her church youth group. When she got home, Chuck and I grilled her on all the particulars as we strolled down our own memory lane. Chuck: Did they have a disco ball? Chuck: Did they turn the lights down low? Chuck: Did they play music? Goose: Yeah. They played old-timey stuff like Eye of the Tiger. When did old-timey go from Jimmy Crack Corn to Eye of the Tiger?? On July 31, BigHugs turned 7. Seven! 1. She calls a 2-piece bathing suit a boo-kini. I like you so much. You are smart. You are the little red hen. And you are kind and sweet. I like your handwritinge. You are cute. I like your jackit. She is popular, not because she plays into the girl drama and manipulations that were already running rampant through her first grade classroom (that was so confusing to her! ), but because she is kind and sweet to everyone. 5. 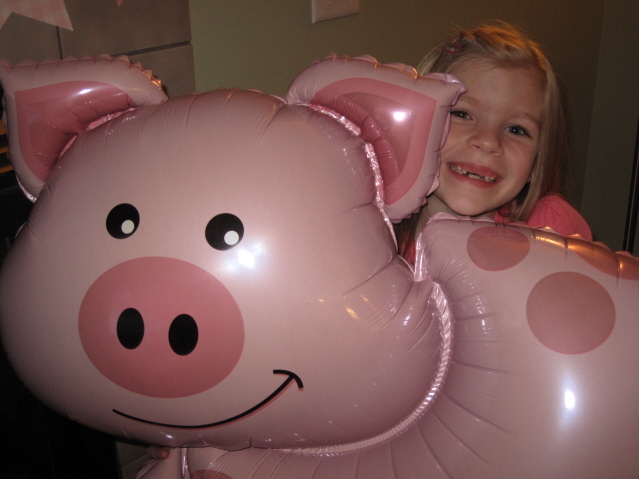 She still absolutely adores pigs, and even had a pig-themed birthday party this year. 6. She is very sensitive to others and has a well-developed conscience. She feels guilt when she has done something wrong or thinks she’s done something wrong, and feels really bad if she thinks she has hurt someone else’s feelings. She is very quick to apologize and take responsibility for her actions. Happy 7th Birthday, BigHugs! We love you!